Calgary had a glimpse of spring this past weekend - - and then a big cold front blew in yesterday and we are back to below normal temperatures and a forecast of snow. Enough already!! 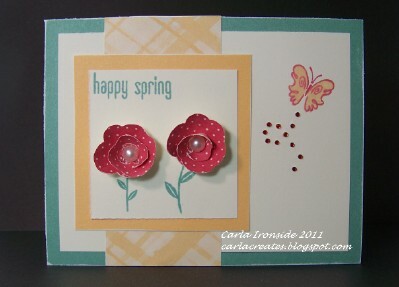 So while we wait for winter to end - - I'll just think spring in my craft room to keep my spirits up! Love these fun 3D flowers from the "Spring Up" stamp set! Your card is so cute. I am going to have to get that stamp set. I am so into paper flowers. Hi Carla, I see you discovered your award. I love your ideas and look forward to gorgeous artwork every time I visit your blog.